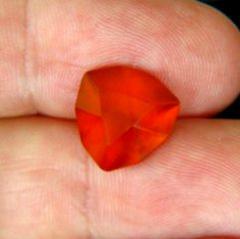 Comment: Hessonite with this type of silky crystal is as old and famous as a gem can be. 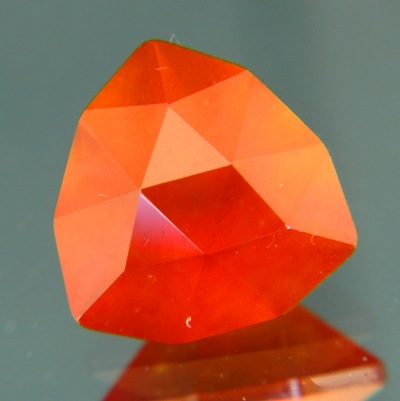 Also called "cinnamon stone" it was said to be found only on the heads of dragons in ancient Greek (which is, guess, of course non-sense). This rough was found less spectacular in the rivers of Ceylon and no dragons have been slain for it (we wouldn't do such a thing). It was then master-cut by Peter Torraca in the US of A. Do not expect this gem to sparkle in the classical sense of brilliancy; it more emits a mild glow and seems to be fluid and moving. Great pendant stuff.